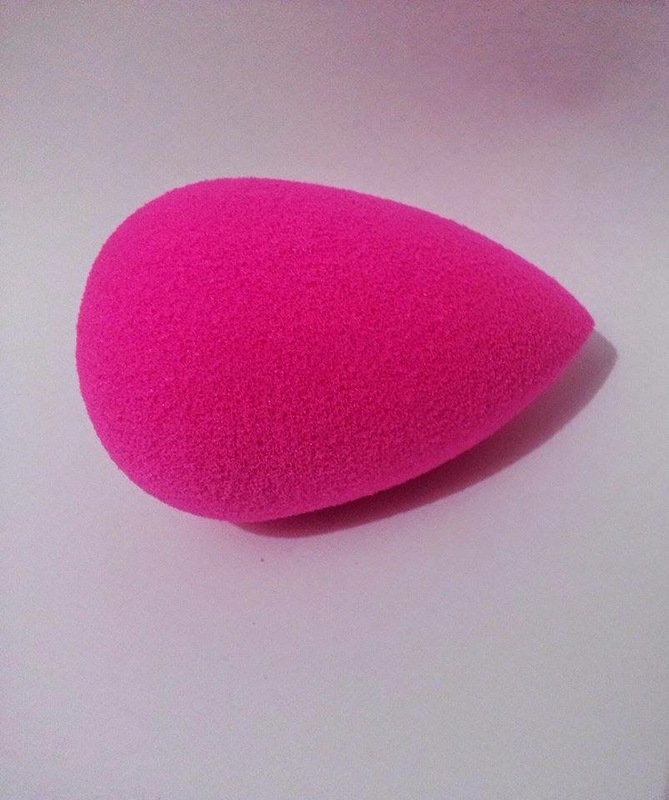 Company/Brand Claim: The world’s first edgeless, non-disposable, high-definition cosmetic sponge applicator. 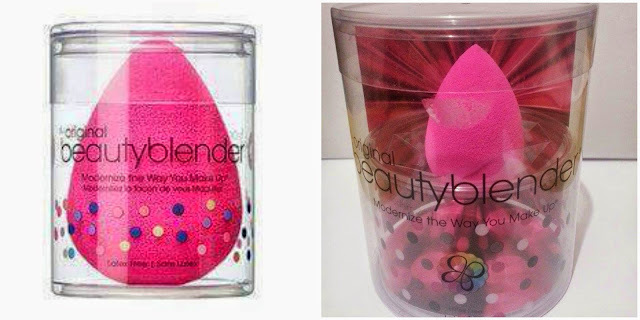 The unique shape and exclusive material available only with beautyblender® ensures impeccable, streak-free application with minimum product waste. Use it with primers, foundations, powders, cream blushes, and any other complexion product. Result: Yes! 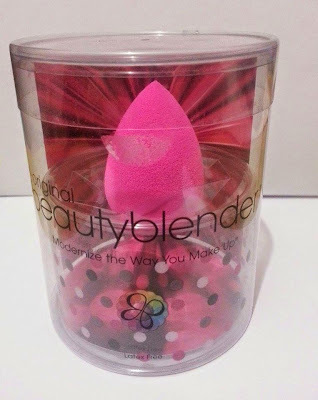 I am finally going to review "The" Beauty Blender, today. 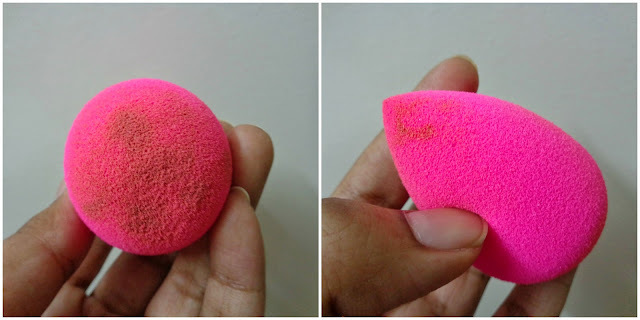 To be honest, I never understood the excitement behind a little pink sponge that looks nothing special but when I saw a lot of You tube beauty gurus use it for a flawless foundation application and all those crazy reviews on the internet, I decided to give it a shot whenever I get a chance. So, when it arrived in the mail, I couldn't believe my eyes. I went numb for a minute when I saw how little it was in that big box. I didn't know whether I should be happy that I finally had it or scratch my head and wonder if I made a mistake. But I absolutely did not expect it to be this small-ish. So what led to the confusion? Let me show you. Image 2: What I got. The two images above might have given you an idea about my dilemma. The first picture is what got my attention in the first place. The blender is almost the size of its box. 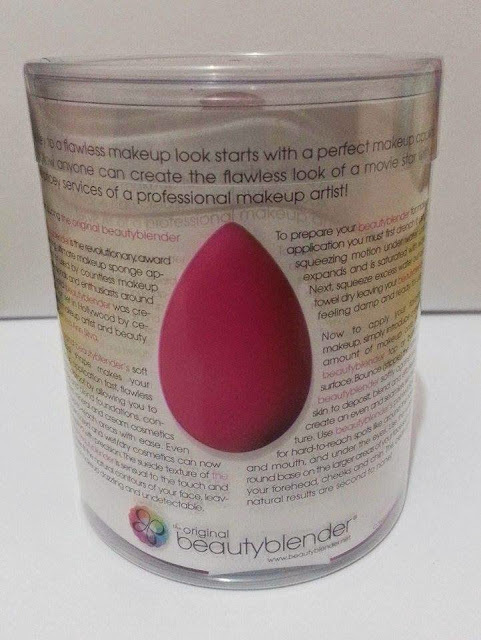 On the other side is my ordered beauty blender which rests in the center of the box. If I somehow knew it was this tiny, I would not have spent a fortune on it.Well, there was nothing that could be done. So here's my opinion. It comes packaged in a little plastic jar with the instructions label inside. There's a little hole on the jar lid which helps air enter freely so the sponge may dry. 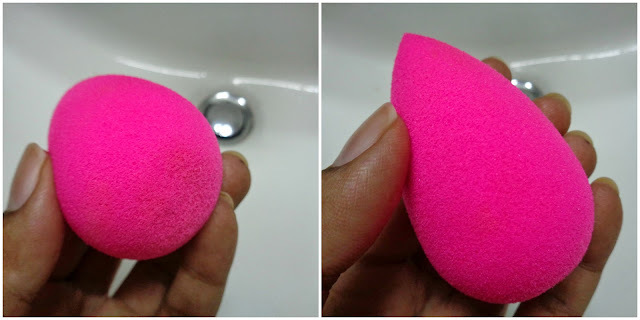 The way to use it is to hold it under running water and lightly squeeze it. It is very soft and starts to absorb water, becomes mushy and grows double its original size. It's actually fun to watch. When it seems to grow no more, squeeze out all the water, which will leave it damp. 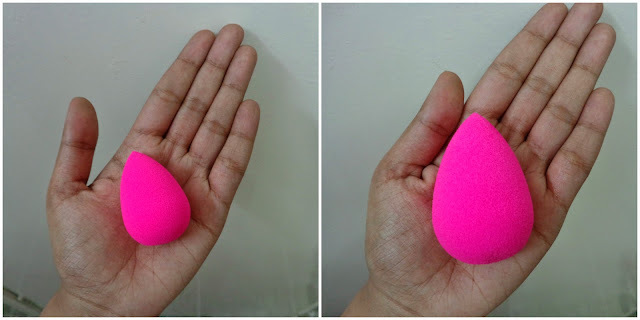 Dot your face with foundation and press the beauty blender against your skin in a stippling motion. Use the pointed side for the under eye area, corners and around the nose. The end result is absolutely beautiful. 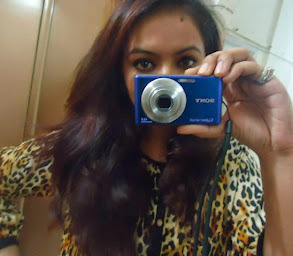 It blended my foundation really well, along with my concealer, creating an even complexion. I've been using it for the past week almost daily. One concern I do have is that it soaks up a bit of foundation. It can be used to blend other cream products. When it comes to cleaning it, I used a few drops of baby shampoo and it was as good as new. There's a separate cleanser available for the beauty blender but I didn't want to spend lots of money on that as well so I tried the shampoo trick and thankfully it worked. I let it rest in its jar without any cover and it took quite a few hours to dry and restore to its original size, at room temperature. The beauty blender is not a regular sponge. It is a beauty tool that needs to be used carefully and protected, otherwise it can tear up easily or even catch a fungus. Thanks to my beauty blogger friends who advised me to not to rub it rigorously and use a soft hand, I have been pretty careful with it. Plus, I read somewhere, it will last for about 6 months. The Beauty Blender comes in 4 other variants namely, the Beauty Blender Pro, which is black in color. This is meant for application of darker makeup products. Pure, which is white. It is meant to be used for sensitive skin. Red Carpet, as the name implies, it is red in color. It is the same as the original and only different in color. 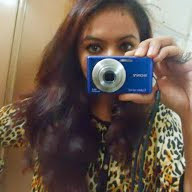 Royal, which is purple, is a limited edition color. There's also a micro mini version consisting of 2, light green beauty blenders that are 1/4th the size of the original one. These are meant to be used under the eyes, brow bone and corners of the eyes and nose. 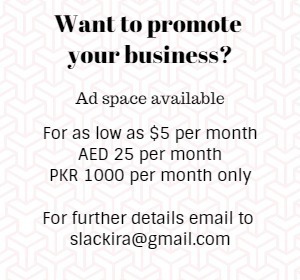 Pakistan: Online only through Facebook pages. I got mine from INDELATH. Conclusion: It rests in the front row in my vanity because it is a real helper. Recommended? Yes. Image 2: Size when it's damp. Kiran I never have had a chance yo try it out...but after reading your post would grap my hand on it. Following you. Once upon a time, i want to buy this beauty baby, but but it was too way expensive so i just do a sabar over it and get blending brush, and now i am satisfied with this brush. I so badly want one! My concern is it catching a fungus. Absolutely loved your review! 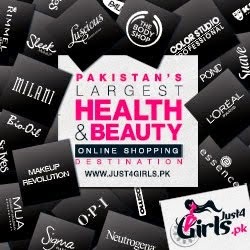 Nice review and it is showing real beauty. I am personally disappointed with BB. I prefer my RT sponge over it.